The periodontist is a dentist who specializes in taking care of your gums. Periodontists are the dental professionals who focus on prevention, diagnosis and treatment of diseases that affect the gums, as well as other structures that support the teeth. Among other things, they can recognize and treat the early stages of gum inflammation before it worsens; perform minor surgery to resolve complicated cases of periodontitis (severe gum disease); use lasers or gum grafting techniques to restore the appearance of a smile; and even place dental implants in the jaw, when a tooth can’t be saved. Periodontists are sometimes called “the plastic surgeons of dentistry.” They can use various techniques to remodel soft tissue, and even reshape bone in the jaw. They aren’t only concerned with outward appearances; maintaining healthy, disease-free gums is a key part of good oral health. And when you consider that gum disease is the leading cause of tooth loss in adults, you can see how important healthy gums really are. Periodontists have a wide array of tools available to fight gum disease. Treatment generally starts with the least invasive and costly measures, which are non-surgical procedures. These include scaling and root planing, where special hand-held instruments are used to clean the root surfaces of the teeth. Lasers are sometimes used in this procedure, and some patients also receive antimicrobial medications. The removal of dental plaque and hardened calculus (tartar) from tooth surfaces that lie under the gums is sometimes enough to resolve a patient’s gum disease. If periodontal disease has progressed to the point where gum tissue no longer fits snugly against the teeth, minor gum surgery may be needed. A small “flap” may be opened in the gum tissue, enabling infected tissue and bacteria to be removed from an infected “pocket” under the gums; healthier gum tissue can then begin naturally reattaching to bone. This “pocket reduction” surgery is an effective treatment which, in many cases, stops the progression of periodontal disease. Gum disease can erode bone in the jaw and damage the tissues that surround and support your teeth; left untreated, it may eventually lead to tooth loss. To help reverse the damage, your periodontist may recommend various regenerative procedures. Bone grafts, gum grafts and tissue-stimulating growth factors can be used to repair damage to these tooth-supporting structures, and help you preserve your natural teeth. What other treatments do Periodontists offer? When teeth can’t be saved, many periodontists can provide today’s premier tooth-replacement system: the dental implant. Placed into the jawbone in a minor surgical procedure, these prosthetic teeth are natural-looking and fully functional tooth replacements that can last for the rest of your life. Periodontists also offer a number of treatments that can improve the appearance of your smile and resolve some dental problems. If you have gum recession, for example, gum graft surgery can be used to cover the exposed roots of teeth with healthy gum tissue—your own tissue, or processed material from a donor. This can give you a better-looking smile, and may also reduce tooth sensitivity and protect against tooth decay in this area. Crown lengthening surgery can be used as part of a tooth restoration procedure, or to change the appearance of a “gummy” smile—one where there seems to be too much gum and too little tooth. In this procedure, excess gum tissue is reshaped to allow more of the natural tooth (or teeth) to show. Effective brushing and flossing, along with regular professional teeth cleaning, helps prevent tooth decay and gum disease. 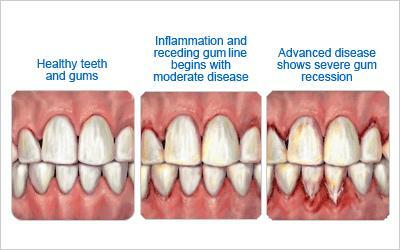 However, even people who are very attentive to their oral hygiene can’t keep gum disease from getting started. When that occurs, it’s time to see a periodontist. Your general dentist may recommend a visit to the gum specialist if he or she notices a problem—but you don’t usually need a referral to schedule a consultation. In addition, you can talk to a periodontist about improving the look of your smile with some periodontal plastic surgery. While periodontal therapy may take many forms, it has the same goals: to restore diseased or damaged tissues to good health; to improve the appearance and function of every part of your smile; and to allow you to keep your natural teeth for as long as possible.